SOUTH YARMOUTH — For eight years Christine Pierson prayed for their safety whenever she saw one-eyed Gramps march his family of geese across Route 28 to munch the motel’s tasty spring grass. And for eight years, she said, God listened. But April 1 the inevitable happened. A black SUV barreled down the road just as the seven geese crossed back to James Pond behind the Hearth ‘N Kettle Restaurant Plaza. The geese wailed. Two were dead. The car sped off. 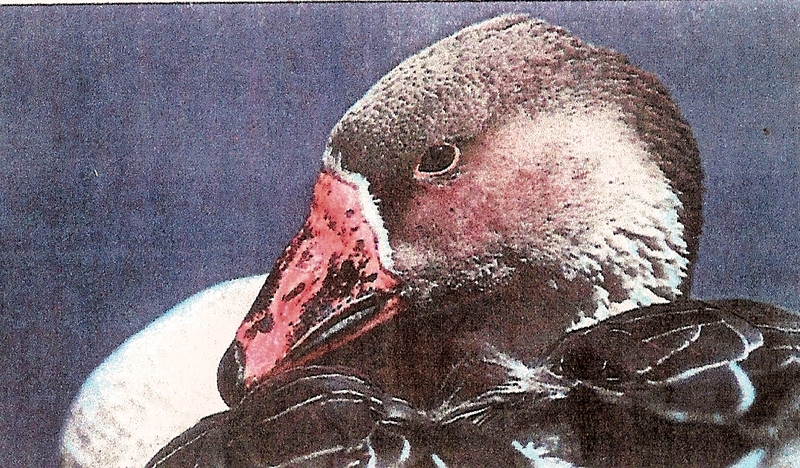 One week later that disbelief continues to linger in a small corner of South Yarmouth where the beloved flock of orange-beaked geese has made its home for more than a decade. Now, Begin wants action. She wants a “Geese Crossing” sign put up at the plaza. She wants folks to know the geese are there. And she wants the driver of that vehicle to make amends for the hit-and-run, either by paying for the sign or donating to a wildlife fund – “in memory of the poor animals that were happy for 10 years until she came along,” Begin said. Cars run over cats and coyotes, dogs and deer, skunks and squirrels all the time. But this isn’t your average roadkill. The geese are an exotic breed of domesticated Toulouse birds, not the common black-necked Canada geese. Though some explanations have been offered, no one seems quite sure how they got there. They’ve lived at the scrub-pine-ringed freshwater pond behind the shopping plaza for so long that some have acquired names. There’s Gramps – the leader. One woman playfully suggested he lost his eye in a bar fight, though a fishhook is the more likely culprit. There’s Auntie – they call her that because she never laid eggs. And there’s Crooked Neck – Auntie attacked her when she was a gosling, and she came back from the vet with a crooked neck. To get an idea of the affection these birds arouse, look at what the Hearth ‘N Kettle restaurant alone has done. Employees there attached a doghouse to a raft and anchored it in the pond so the geese would have a place to nest. Above the doghouse is a sign: “Fowl Manor.” Mounted below the raft is a pump that circulates the water when the temperatures sinks below 40 degrees. “If the pond were to freeze shore to shore, they’d all die,” said Willie Jackson, manager of the restaurant plaza. The birds munch iceberg lettuce behind the restaurant. They stroll up to Thompson’s bird shop and peck at the back door, knowing they’ll get a meal of cracked corn. After they lost a couple of geese to frostbite one year, Thompson started laying bales of hay by the pond to keep them toasty in winter. But once spring shoots up the fresh green grass at the All Seasons Motor Inn’s front lawn, the birds start making their perilous daily marches across Route 28. Yesterday, feathers mixed with a few cigarette butts were still visible in the grass near the accident scene. Begin, owner of Pick of the Litter pet boutique, crinkled her lips to hold back tears as she stood describing the night that has replayed in her mind every day since. On April 1 the wind howled and the rain poured. It was dark. Begin, waiting to catch the 5:50 p.m. bus, walked backward to block the gusts as she watched the geese cross. About five cars had stopped in the eastbound lane to let them pass – locals know this routine well, and sometimes the tourists snap pictures. But going westbound was a black SUV doing nearly 50 miles per hour, Begin said. The driver was looking to her right at the shops she was passing, Begin said. “I was hoping beyond hope that at the last second she would see them and stop,” Begin said. Instead, seconds later she crashed through the line of seven birds – tagging along with the six Toulouse birds was Dudley, a well-known Canada goose – and struck four. Her brake lights flickered on. But then she roared off. Two other motorists stopped, and a woman wrapped Crooked Neck in an old sweatshirt and drove the bird to the vet. Crooked Neck sustained minor injuries and was released to the pond the next day. The other geese greeted Crooked Neck’s return warmly. The vet described the homecoming in a message she left on Begin’s voice mail. She has not deleted it. Dudley has not been seen since the accident. As for the “Geese Crossing” sign, its future is unclear. Some wonder whether it would even help. The geese cross wherever they feel like it. Where would you put the sign? When Begin called the highway department about the sign, the woman who answered promised to look into it.